New York-based Mount Sinai Medical Center has started a clinical study to assess Heart Test Laboratories’ (HTL) MyoVista heart screening device. The study has been designed to evaluate the indications of MyoVista for the identification of coronary arterial disease (CAD) as compared to computed tomographic coronary angiography (CTA) and myocardial dysfunction in patients without CAD as compared to echocardiography. Cardiac Ultrasound Research and Core Lab director Dr Partho Sengupta is the principal investigator of the study, which will enroll up to 200 patients. The trial is expected to take around 12 to 24 months to completely assess the heart screening device. Heart Test Laboratories CEO Mark Hilz said: "Mount Sinai is one of the most respected medical institutions in the world and has a strong reputation for research along with being recognized as a center of excellence in cardiology. "Our goal is to save lives and save healthcare dollars by both finding people with heart disease much earlier, and reducing expensive cardiac testing on people that do not require treatment." 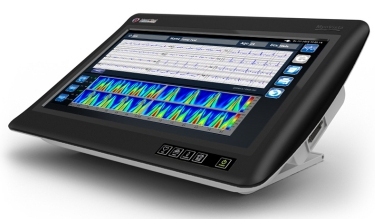 MyoVista, which offers two tests in one, uses 12-lead resting protocols to provide an ECG test integrating interpretive analysis and proprietary informatics that will enable in identifying heart disease at an early stage. The device also provides additional information, allowing physicians to refer patients to undergo further diagnostic testing and treatment. Featuring 15.6in high resolution touchscreen, the device can be used in both primary care and hospital environments. The software of MyoVista deploys a series of algorithms, which have been designed using comparative analysis of a 50,000 patient database used for research and development purposes. Image: MyoVista device enables early detection of heart disease. Photo: courtesy of Business Wire.